In the early days, I’d stand over her cot, watching. A bed full of pink blankets and pink onesies and pink swaddling and tiny little pink face, peaceful as she slept. Her brothers rowdy and bouncing just outside the door, and with just a finger to my lips, they would tip toe in, and creep up beside me. Propping one on each hip, I would snuggle my boys as we all soaked in the adorable of our newest baby. A little cough, a shudder, and her head would turn, and the swaddling wrap would rustle. Slowly, the top edge would wiggle and wiggle and shift to make room for the tiniest of hands to snake out and find it’s way to her face, eyes still scrunched closed but mouth seeking for comfort. Her hand would meet it’s target, and into the mouth would go some fingers, or a thumb. In those early days, she often favoured her ring & middle fingers, with the pinky resting up alongside her nose. As she grew, the thumb became more popular, and eventually the only choice. 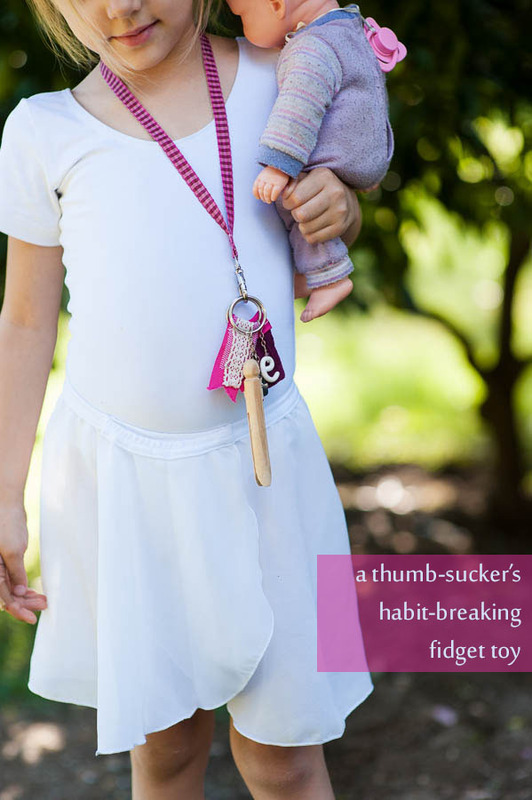 After speaking with her preschool, we bandied about some ideas, and it firmed up my decision to get busy & make her a fidget toy – a concept I had mentally been chewing over, but was uncertain how to proceed. The conversation was just the kick up the pants I needed to stop overthinking it, so over the weekend, with the baby sleeping and the three big children happily ensconced in front of a movie, I started pulling “stuff”. I still had no firm plan except that I wanted something she could wear around her neck (bearing in mind this would only be used at “quite” times, not during active play where it might get caught, or for sleeping, where it may be a choking hazard), and something with lots of texture & tactile interest, while trying to also keep to a reasonably cohesive colour scheme. I wanted it to be fun & busy, but not gaudy. Our little Butterfly is a thumb sucker, which becomes more pronounced when she has nothing to do with her hands, so today I'm pulling out some fabric of different textures, some ribbons, lace & beads, and having a go at making her a fidget toy. My collection grew as I found things & my ideas grew. I ended up with the above spread – wool, curtain fabric, corduroy, taffeta, organza, tulle, ribbon, lace, beads, peg, lanyard. I later added in a Fimo “e” as well, and ended up creating three separate rings of sensory goodness so we can mix it up and have as little or as much as she needs. Ring one – grosgrain ribbon, tulle, lace tag, and chain drop holding a handmade Fimo initial with a small bead. Ring two – two double sided tags, one with wool & woven curtain fabric, one with corduroy & taffeta. Both were bound & sewn on using the same grosgrain ribbon as ring one, and joined in a v-shape. Ring three – a wooden dolls peg, and a chain drop with a couple of pearl beads on separate pins to create movement & make them more fun to play with. And the verdict – success! At home, I do have to remind her to put it on, but once it’s on, she reaches for it instead of sucking her thumb. She had her first day of preschool with it yesterday, and the teacher reported that it worked perfectly & she could use 10 of them. Guess I know what my next project is now! !